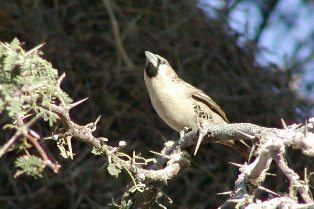 This is a new project for teams of ringers to make an important contribution to studying the population dynamics of the Sociable Weaver Philetairus socius, a cooperative breeder restricted to arid and semi-arid regions of southern Africa. This species could show large range changes in future decades due to climate change. 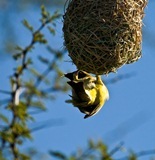 Ringers can help track these changes by ringing at selected colonies on an annual basis to obtain survival and breeding productivity data, combined with counting nest chambers to provide nest size data. Thus this project will link data collected by citizen scientists for SAFRING and PHOWN. This project will run for at least 5 years, starting in August 2012. Read the project protocol here.